At the age of nine Conan Doyle was sent to the Roman Catholic Jesuit preparatory school, Hodder Place, Stonyhurst. 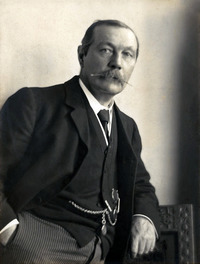 He then went on to Stonyhurst College, leavin Sir Arthur Conan Doyle was born the third of ten siblings on 22 May 1859 in Edinburgh, Scotland. His father, Charles Altamont Doyle, was born in England of Irish descent, and his mother, born Mary Foley, was Irish. They were married in 1855.